Flutist's Question about a beach setting for background flute music. I've been asked to play a beach wedding, and want to be prepared. It's likely to be flute and guitar, or perhaps two flutists. 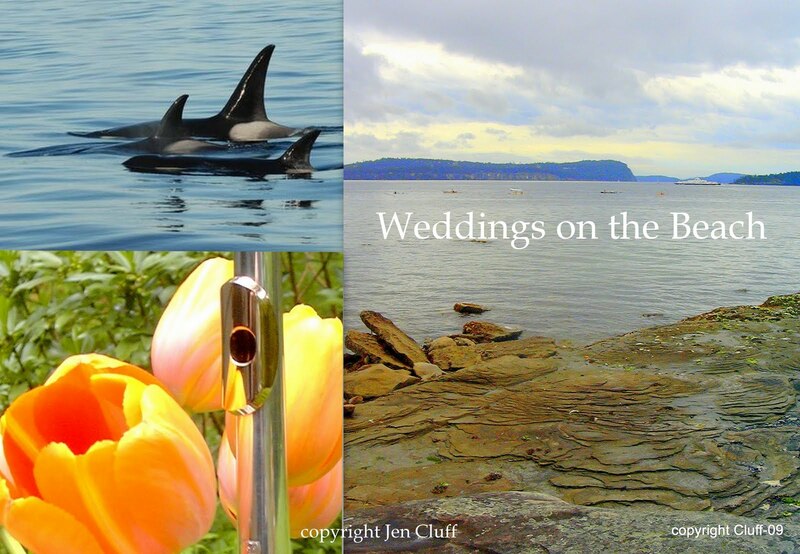 What special requirements do beach weddings present to flute players? Is the possible windiness the biggest problem? And will the flute need amplification? Or will the flute sound carry well outdoors? Should I worry about the salt air corroding my good flute? Note: Do help yourself to the wedding flute duet book I have in pdf, in case it's useful to you. Hopefully you will not experience all the hazards in one wedding. :>) Most outdoor flute weddings go extremely well. Flute carries on the wind, far better than strings, holds up to the challenges and the sound of two flutes creates a delightful ambiance. Firstly, I believe that it is a bit of a myth that salt does anything particularly corrosive to the flute. I live within 60 yards of the ocean and my flute has not had any sand or salt-related problems in 15 years. Secondly, you are correct that the direction and ferocity of the wind *is* the primary problem with beach wedding ceremonies. We arrive 30+ minutes early, to meet with those setting up the wedding, in order to walk around and scout out the best location for the musicians. We require, in the wedding contract, that we will place the musicians in the most wind-free location, in the shade if possible, and on level ground. Often this means relocating or re-orienting the placement of the wedding party prior to commencing the service, if it is a particularly windy day. We always look for a flat place to stand or sit. Playing music for an hour on a slanting surface can truly charley-horse your muscles, which you will only realize later. Each of us takes two clear 8x11 rectangles of plexiglass to use as sheetmusic covers (rather than clothes-pegs or music clips) to cover the sheetmusic. I keep my plexiglass in a folder with a cardboard piece between them so they don't scratch eachother during storage. We gently alert the wedding planners that if the wind changes direction, that the musicians may then have to turn and face another direction, briefly, to allow the flutes to still speak. Wind silences the flute. So listeners can disregard any angle changes by the musicians. Yes, flutist will have to keep the wind to your back, but doing so also helps carry the flute sound farther, which is a bonus. It's also important to know the address and driving directions to the alternate rain location, so you can specify a space for that on the contract also. Also: remember to take sunglasses. White sheetmusic pages can really glare in bright sunlight, and there are even times when you have to face the sun in order to keep your back to the wind. It can look a bit like a "blues brothers" moment, so remove your sunglasses, if possible, for photos. Also take water, sun-screen, and tie hair out of the way so it doesn't blow into the embouchure. With a duo of classical guitar (nylon string) and flute, we almost always have to have the guitar slightly amplified or the guitar (but not the flute) becomes inaudible at a distance. This means running an electrical cord out to a small, lightweight amplifier which is placed under the guitarist's chair. If the guitarist uses a footstool, he/she may need to bring a board to place it on to get it level. The guitarist in my case always brought his own very long extension cord, but be aware that you may need more than one, depending on the distance of the power outlet. And that too many linked extension cords may not carry sufficient power. A pre-viewing of the beach area for these electrical cord considerations may be required. If the location is too remote for guitar and amp, switch to two flutes, or flute and another string family member. Weighting the music stand: In gusty wind conditions, even a manhasset stand may be blown over and may need weighting at the base. We use available rocks in situ, if possible. Fifthly, do watch your step and do not wear difficult-to-walk-in shoes; wear flats with some grip. Spikey heels sink into soft sand and soft sandy lawns. Also, keep your gig bags very well organized and close to hand so you can unpack and re-pack quickly when finished. Yes, you'll want all the sheetmusic in a binder, already in order, and you'll want to pre-practise moving the plexiglass sheets (there will be two of them, left and right) one at a time with one hand, for page turns. There's a trick to this, in that you slide the right hand plexiglass to between the next two pages with one hand, (your flute or guitar is in the other hand) prior to lifting the left plexiglass and turning the page and weighting it with the second plexiglass. If the wedding planners choose a location that is fairly wind-protected in the first place (and you can visit it in advance to see what it's like during 'typical' weather) then everything becomes easier. You can also put a clause or caution in your contract that you do not perform on valuable instruments without a tent for the musicians if the weather on the day of the wedding is too severe or rain begins. One bonus, I might mention, is that at one string and flute trio wedding we did on a cliff top above a beach, the weather turned fabulous just an hour before ceremony time, and right in the middle of the wedding three Orcas spouted and surfaced just off the point we were standing on. (See above photo at top). These beach weddings can be very memorable. :>) Enjoy! I lived in New Mexico for many years before moving to Michigan. In the New Mexican Indian culture the Indian flute is used for many things, not the least of which is the playing of love songs. I've attended weddings high in the mountains where a flute was used as the primary instrument. There is nothing quite like the flute song borne on outdoor breezes. Nothing like it in the world. You will contribute greatly to this event. I really liked your website and am referring it to one of my harp friends in Oregon. Good job. I did not realize how complicated having flutes at an outdoor wedding was. 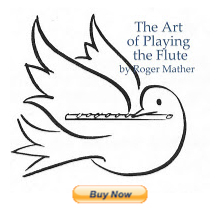 Are you a flute player? Can you imagine how hilarious it is when you're playing away and suddenly no sound comes out? And then your stand falls over, and you lose all your page turns? And the bride is doing a perfect entrance? One beach wedding I did we had to play the processional for 20 minutes instead of the rehearsal's 6 minutes, because the bride wanted to walk from down the beach toward the ceremony BAREFOOT. The rocks were really sharp and she had to go very slowly and look graceful (she did! ). At that wedding we had an outdoor harpsichord that mircaculously stayed in tune, even after being moved twice! One outdoor wedding on a cliff, the bride and groom let a box full of butterflies free at the end of the ceremony. But like a girl guide, I like to have my wind-protecting plans at the ready.